This week’s challenge at Classy Cards ‘n Such is Polka Dot Christmas! There is an inspiration photo for you, and the colors from the photo I chose to work with were white, yellow (gold), and copper which appears on the red curtain’s polka dots. As always we have a prize from the store for a lucky winner and the classiest participating card will be awarded too! For today’s card I used Spellbinders 2012 Holiday Tree to die cut a window on a piece of White Pearl Linen, which I die cut next with A2 Matting Basics A. Then I dry embossed the white layer with a polka dot embossing folder, similar to Crafts-Too Dots embossing folder. I also die cut a piece of Precious Metals Craft Foil by Spellbinders in copper with A2 Matting Basics A, and dried embossed it the same way I did with the white layer. I mounted the white piece on top of the craft foil, but not before wrapping a piece of gold cording across them and tying a little bow. 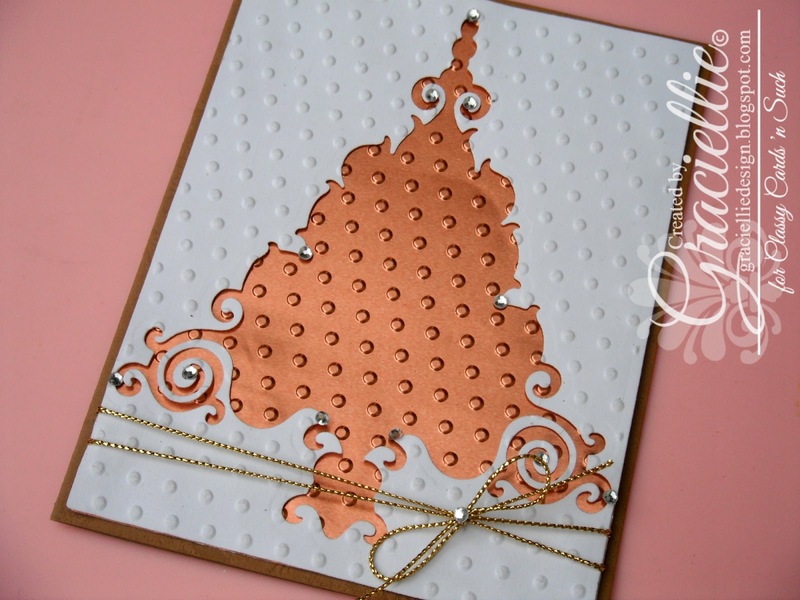 I adhered it all to a light brown card base and embellished the card with many Baby Rhinestones – Silver. I hope you find time to play along our challenge this week. I also motivate you to invite your friends to play along. The more participants, the more chances there are to win a prize from the store! To check out the supplies I used for today’s card please click on their links to be directed to Classy Cards ‘n Such store. Remember that new items and new discounts are added all the time, so don’t miss out! If you visit the store and purchase don’t forget to use my code Gracie-10 during checkout to get 10% off your entire order. This is stunning – I love it. Thank you for playing along at Fab'n Funky Challenges. Thanks for joining us at Crafty Hazelnut's Christmas Challenge Extra.